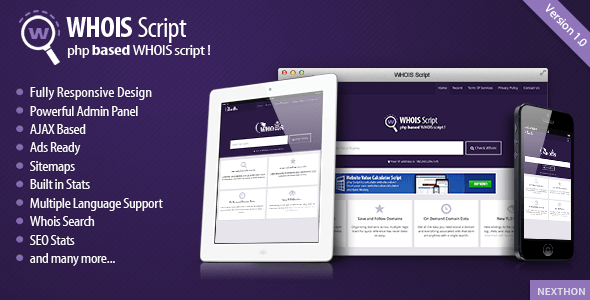 Whois Script is a powerful PHP based script to fetch all the informsation about a domain instantly and efficiently through AJAX. Script is fully responsive based on bootstrap 3 and adjustable on any mobile or tablet screen. This script is intended to lookup for domain registrant data for all top-level domains (both generic and country-code types are supported, 158 TLDs in total), and also for IP whois lookups.